Merlin covers work hard, are stronger and look better longer. Each showcases the latest technology to protect your pool against the relentless forces of nature, as well as the unpredictable nature of children and pets. Other covers simply pale by comparison! Merlin safety covers feature an ingenious strap and anchor system that allows for easy installation and removal using a specially designed tool. Even with its professional protection, our mesh covers are lightweight, making them easy to install, remove and store. SmartMesh is the ultimate in convenience and function when it comes to safety covers. It is no wonder all of our competitors are trying to copy this one of a kind cover material. Available in green, blue and tan. Setting the standard by which all standard mesh covers are measured, Dura-Mesh offers the industry’s highest abrasion resistance, tear strength, burst strength and sunlight shading of any standard mesh cover. We back Dura-Mesh with a 15-year limited warranty. Available in green, black, blue and tan. 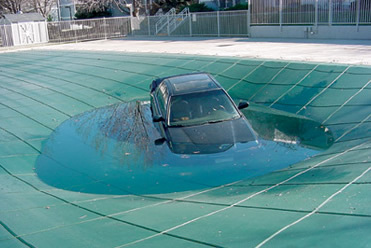 Car accidentally driven onto a 40’ x 80’ Dura-Mesh cover. Driver walked away without injury. Our “tension-secure” solid safety cover offers security plus a complete barrier to water, dirt, dust and sunlight. Additional features include an automatic pump or patented window mesh filter panel to remove standing water. Backed by a 10-year limited warranty.